Snow covered landscapes are a romantic scene found during the holiday season. The only thing that could add to this landscape is a fir tree, evergreen and used particularly at Christmas time. In this corporate Christmas ecards design from eCO2 Greetings, three snow topped fir trees dominate the landscape, making this corporate Christmas ecard a firm favourite amongst our customers. The unmistakable smell of the Christmas tree brings back fond memories for a great number of us around Christmas time. Pictured here are three fir trees – or Christmas trees standing out from a back of similar trees in the background. The ground around the trees is covered in fresh white snow, completing an overall beautiful image of Christmas time outdoors. 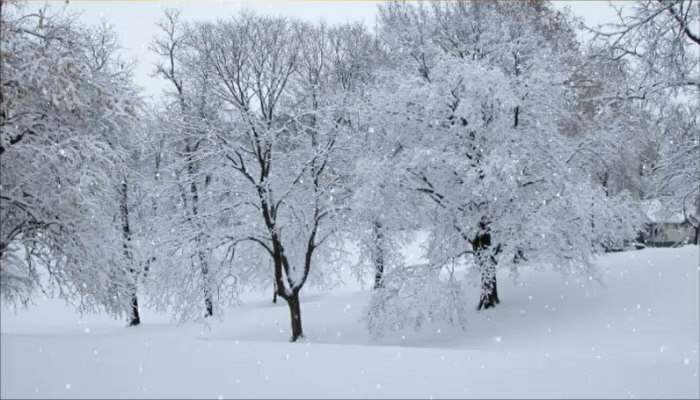 This holiday ecards for business contains a falling snow animation, too, to further complete the perfect Christmas woodland scene. The clear sky in the top left of the image provides space for a personal message in a dark font, fitting nicely with the dark palette of colours used in this design. In addition, you are able to add further corporate messages of Christmas greetings or brand communications on the optional second, third and fourth pages. Choose ‘Snowy Trees’ from our great range of business ecards for Christmas to send to your clients this December holiday.